I’ve had these little pockets of loveliness on my list of things to make for ages, after seeing them on a cooking programme. The Hairy Bikers were travelling round Poland and cooking local foods, so I filed the name in the memory bank to try when I had time. The recipe I used was from Nigel Slater (on the Good Food website) and he gave a few options – sauerkraut and mushroom or potato, cottage cheese and onions. I went for the potato ones. The recipe said you should do half sauerkraut and half potato, but I used up all the dough just with the potato filling, so I’m not sure if my dough wasn’t rolled thin enough, or if I just had too much filling! Looking up more info on the potato dumplings, they’re also known as ‘pierogi ruskie’ or Ruthenain dumplings. Apparently it’s nothing to do with Russia at all and it’s a common mistake to believe there is a link between the two countries. The name actually comes from pre-war Poland’s region known as Red Ruthenia (which is now within a Ukrainian territory). 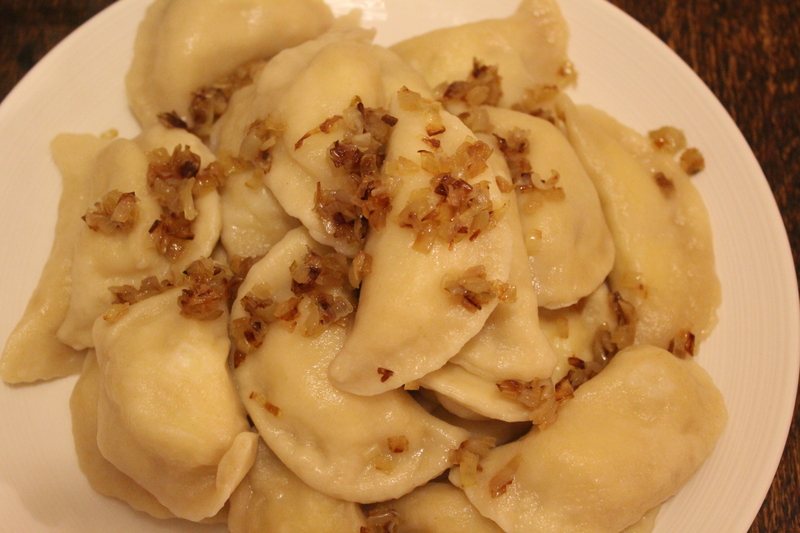 Apparently before 1945, Ukrainians used to call this particular variety ‘Polish pierogi’ and it’s thought that the name pierogi ruskie was created by Poles living in Ukraine at the time. After WW2, when thousands of Poles were forced to leave their homes in Western Ukraine and relocate to the West of Poland, they must have taken the recipe with them and renamed it. 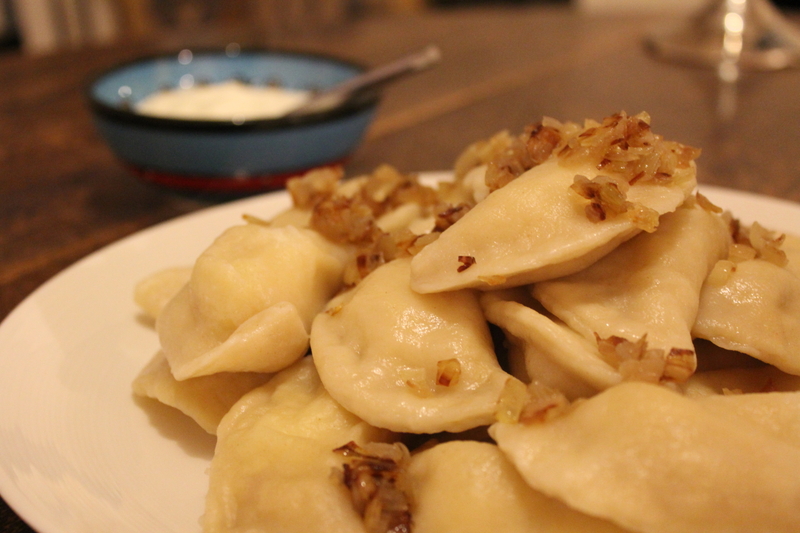 I found a great website (Tasting Poland) that has loads of tips on how to make pierogi, some history about them, and some ideas for lots of fillings. It’s always really interesting to find out about the history of foods and how they came to be, and I think the reason why foods are given particular names is fascinating. Anyway, these little dumplings were relatively straightforward to make, but getting all the elements prepared took a bit of time, so it’s not something you could rustle up in half an hour. I think I’ll make some more at some point and try some different fillings too. Apparently you can freeze the cooked dumplings too, so you can always make a massive batch and just get them out when you need them (just need a bigger freezer). Top tip – don’t defrost them before cooking, put in boiling water straight away for a few minutes till they float to the surface. If you let them defrost, apparently they all stick together and fall apart. Boil the potatoes in a pan of salted water until soft enough to mash (about 20 minutes). Drain well and set aside to cool. Turn the dough out onto a lightly floured work surface and knead for 5-8 minutes, or until it is smooth and glossy. Wrap the dough in a clean tea towel and set aside to rest in a cool room for at least 20 minutes. I left mine for about an hour. 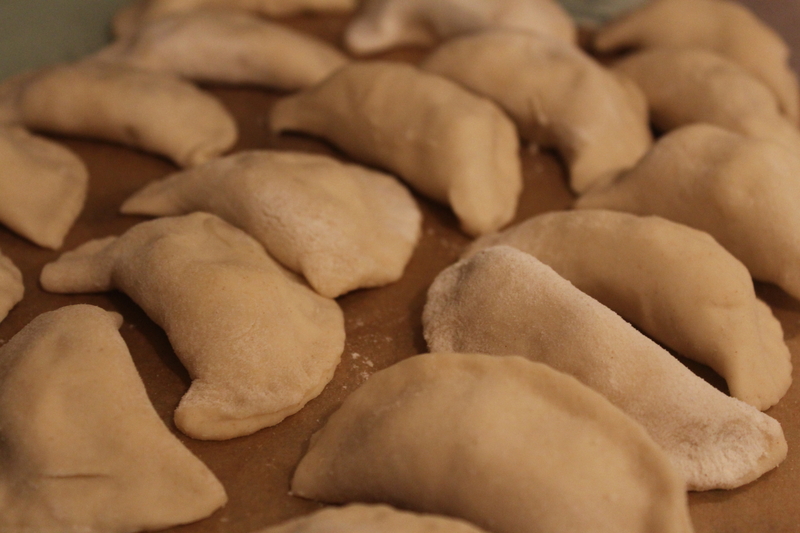 To shape the pierogi, roll out the dough onto a lightly floured surface to a thickness of 3mm. Cut 10cm/4in rounds from it using a pastry cutter. Or just use an upturned glass, as lots of Polish recipes suggest. Place one teaspoonful of the cottage cheese and potato filling into the middle of the dough. Brush a little water around the edge of each pastry round, then fold the edges together to create a bulging semi-circular dumpling, pressing the edges together to seal. To start with I don’t think I put enough filling in each dumpling as I wasn’t sure it was going to fit, but the dough is really elastic so you can stretch it quite easily. Just make sure they’re properly sealed or the filling will all leak out when you boil them. 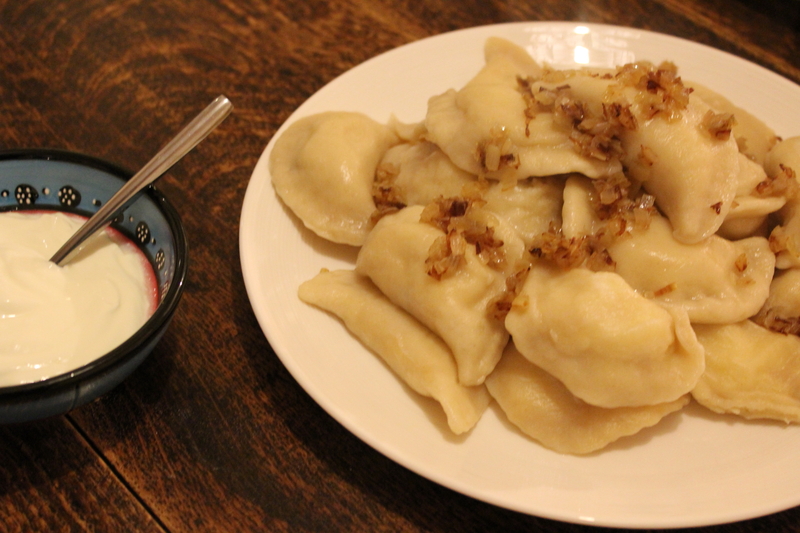 To serve, pile the pierogi onto serving plates and serve the soured cream in small bowls alongside. Sprinkle with the reserved fried onions.